When I was a little kid my family was stationed in England and afternoon tea was an everyday event. My mom has always loved hot tea so this was an extra special time for her as well. This entire Polkadoodle stamp line is absolutely breathtaking. Make sure to check down below my photos for the link to check out all the Design Teams card samples. I was quite impressed by the array of gorgeous projects. 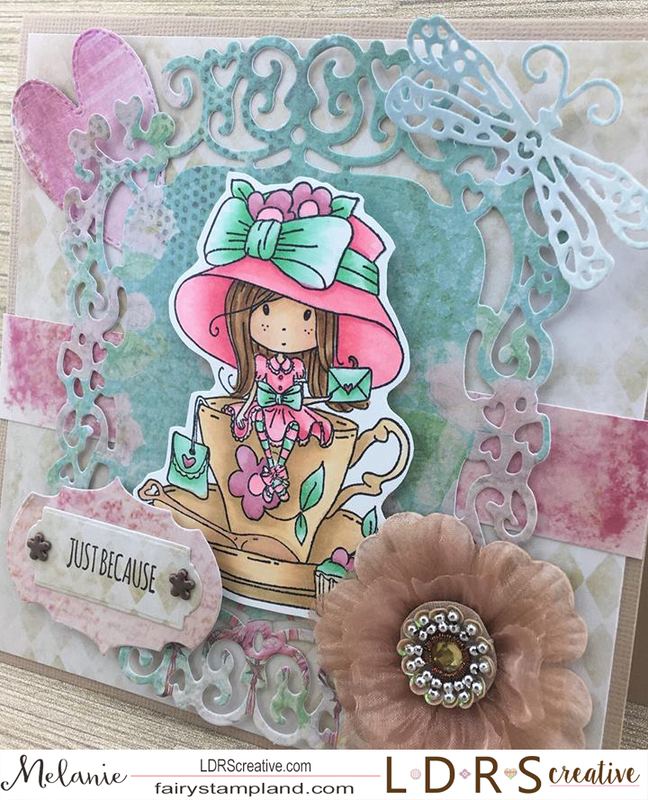 I have chosen "A Tea Cup Full of Wishes" from Polkadoodles for my stamp and I have used the Coordinating Time for Tea 6x6 paper pack which is just beautiful paper. 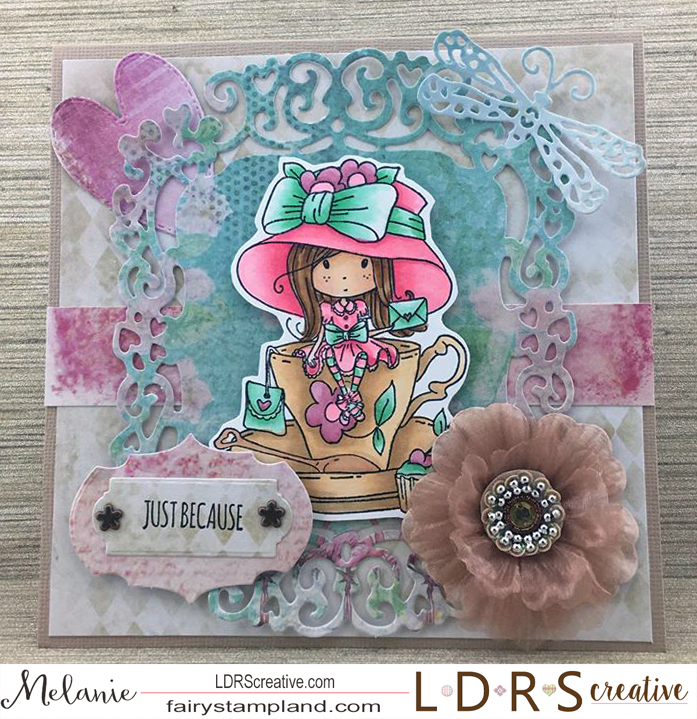 For the LDRS Creative die collection I have chosen the "Regal Frame" Die set also by Polkadoodles along with LDRS Creative Majestic Rectangles Labels Set, the Key Tailed Dragon Fly Die Set., and the "Grace build a Card" die set. 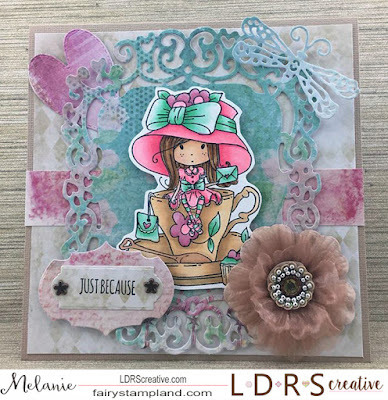 To see all of the beautiful creations all this week from the LDRS Design Team make sure to check back on the Company Blog for all the creative projects. I had an amazing time at the Stamp and Scrapbook Expo here in Atlanta Ga. Made lots of friends and consumed so many wonderful tips and techniques. For participating in this months challenge Elizabeth Craft Designs will be giving away a $20 Gift Card to use on our website to 3 winners. Here is my take on a card using the sanding technique that Els shares in the above you tube video. This was super simple to do and I just love how a tiny bit of the peel off stickers really jazzed it up! Next cut a red card base and a white mat and attach all together. 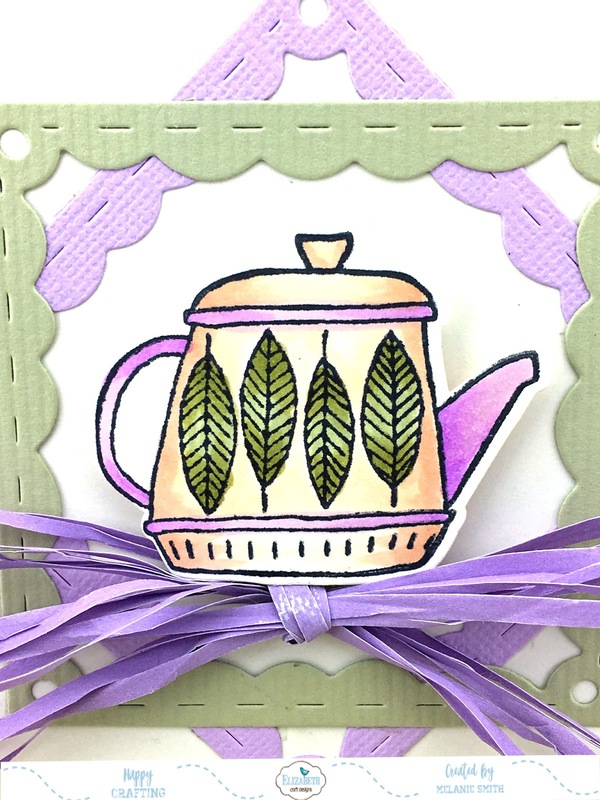 Half a doily was used with a horizontal stripe of card stock. Added to the stripe is a simple glitter line sticker. 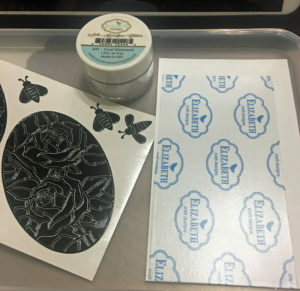 Did you know Elizabeth Craft Designs carried a large array of stickers? These stickers really can add that little extra touch which makes your card sparkle! 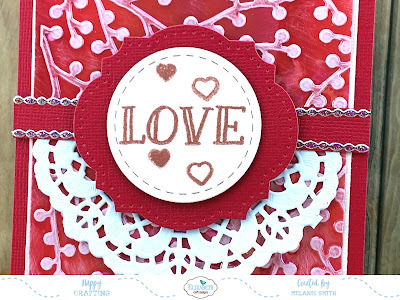 Lastly, I used the Labels and Circle die set which has been reduced to $4.95!!!! Grab it while it is available! The sentiment was used from the Dreams Sentiment Set. Here is a close up to show you the added texture using the Shimmer Sheetz along with the Peel Off Stickers. 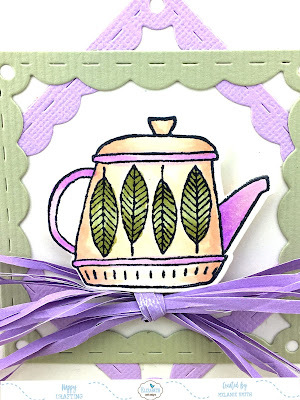 Very simple to add a little something extra special to your cards. I hope you have enjoyed todays challenge. Make sure to head on over to the ECD Challenge blog for your chance to WIN! 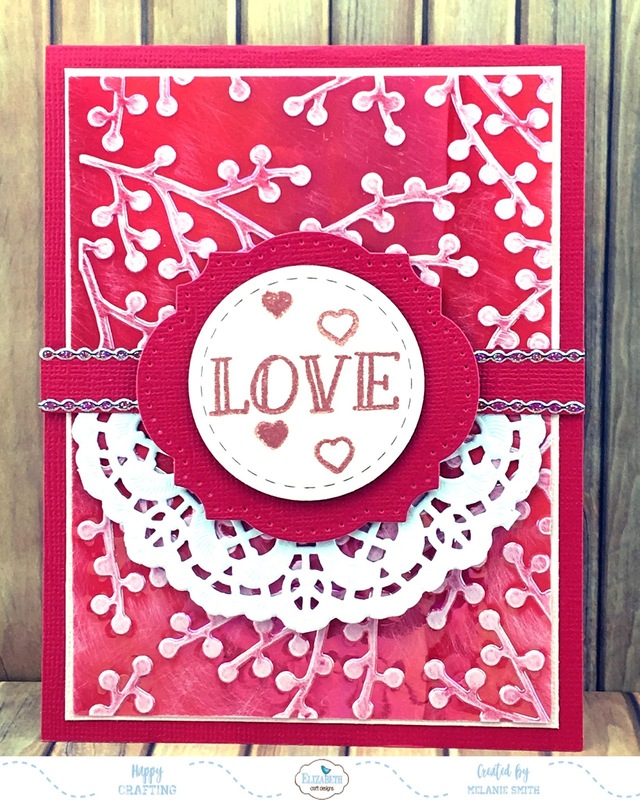 I am here with you to share my newest Elizabeth Craft Designs' project. Today I have played with lots of our dies along with stickers and glitter all from Elizabeth Crafts. I had tons of fun! Follow these easy steps below to create this lovely scallop shaped card. 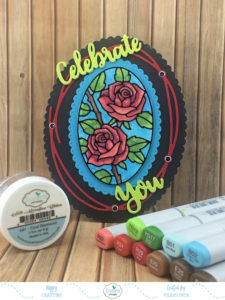 Step 1: To create the glittered roses you first add a piece of double sided adhesive to a piece of Soft Finish Card Stock. Step 2: Peel off the background from your black sticker sheet, this makes it easier to use. Next you will peel off the Elizabeth Craft Designs backing to reveal the sticky side. Set aside. Step 3: Using the backing as a transfer sheet just remove the black outline sticker and lay it on the transfer sheet sticky side up. Step 4: Lay your piece of card stock sticky side down on top of the black sticker. This will transfer the sticker to the sticky side of your white paper. Step 5: Add Microfine Glitter to the entire piece, polish by rubbing all the glitter into the paper. See below. Step 7: After coloring use the 2nd. 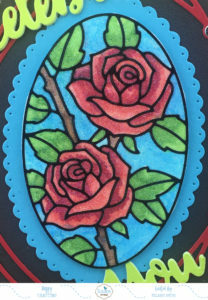 smallest oval die from the Fitted Ovals set to carefully cut out the colored roses. Step8: Use the 3rd smallest Dotted Scallop Oval to cut a blue piece of card stock. Step 9: Cut a piece of black Soft Finish card stock to cut the background piece. 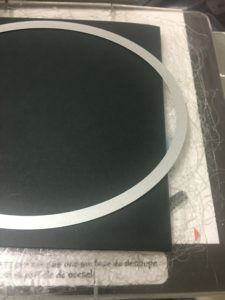 Step 10: Cut a piece of black Soft Finish card stock 4 3/4" x 12" and score in half. 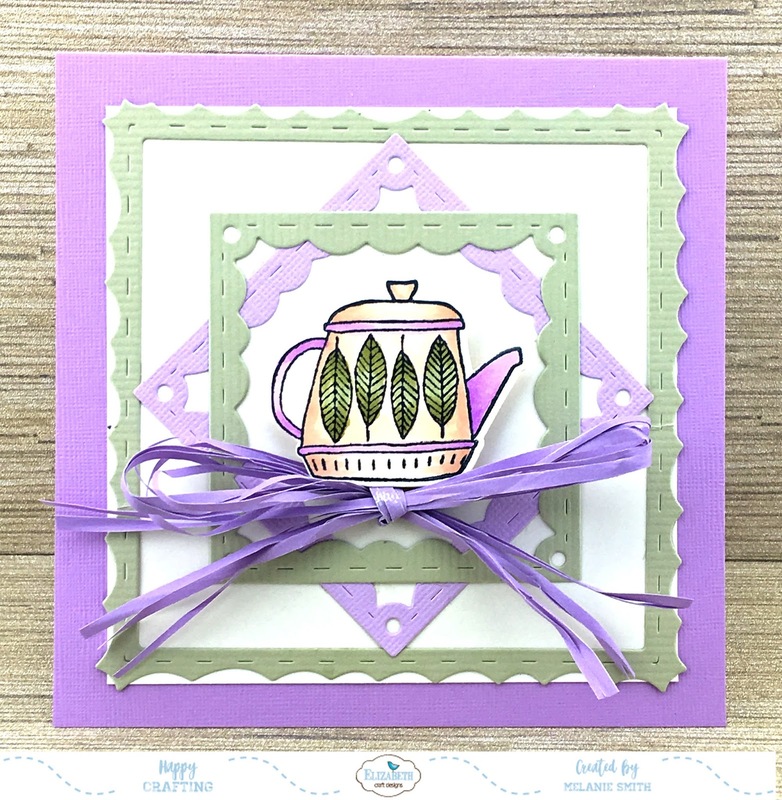 Using the largest Dotted Scallop Oval die cut the folded card with a slight amount of the fold being uncut. See below. 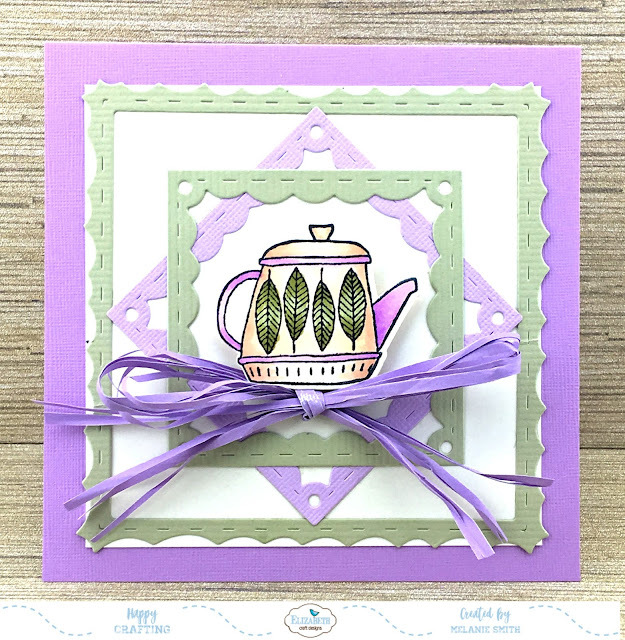 This forms scalloped shaped card base. Step 12: Die cut the word dies 4 times each and glue together. This will give the card a little added dimension. Step 13: The large black oval will be glued to the Card base lining up the scallops. Step 14: Glue the red Entwined Ovals piece onto the black. Add a few of the Black/Silver Glitter Dots to the Entwined Ovals piece for a little added interest. 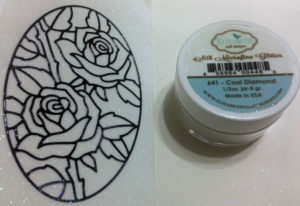 Step 15: Glue the blue Dotted Scallop Oval to the center of the card then using foam tape add the glitter roses to that. Step 16. 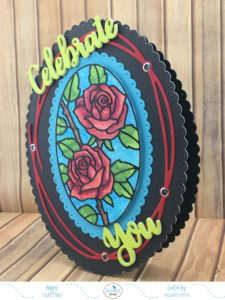 Attach the "Celebrate" and "You" pieces to complete the card. This last photo shows how the raised flowers and extra thick lettering gives this beautiful card more dimension. I hope you have enjoyed today's project. I really enjoyed creating it for all of you! 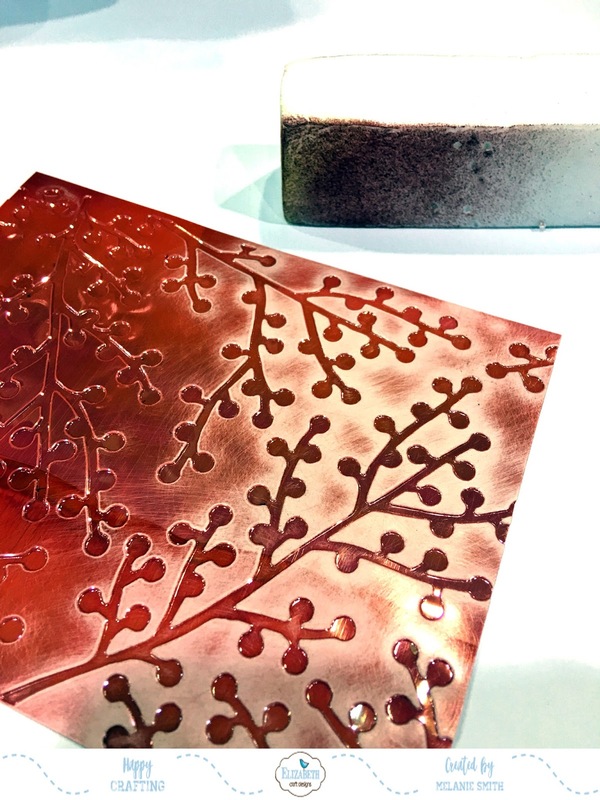 To see more blog posts from the Elizabeth Craft Designs' Design Team simply head on over to the company blog. I'm here with you today to share a bright and cheerful card that is surely able to make you smile. Early in June I attended a crop when 2 friends of mine shared their Tim Holtz crayons with the group. It was my first time using them and it was such fun. I created 2 backgrounds that day. The first one is used in this card and the second is to follow in my next LDRS Creative post later this month. I have used Copic Markers to color in the All Dressed Up Prosecco Time Stamp. I really had fun designing with all these bright colors. 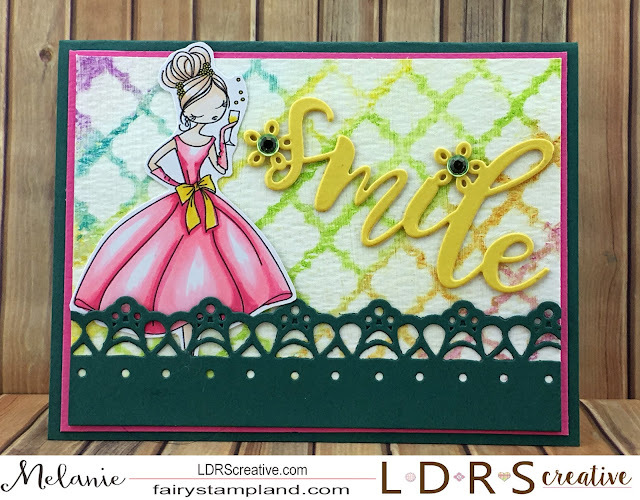 For the dies I chose to use the Dew Drop Border Die along the bottom as well as the Smile Word Die These word dies are really fun. Click HERE to see them all. Elizabeth Craft Designs ~ Using Some Scraps! I have been working on organizing my craft room and keep running across these extra pieces from a previous project that I used Fitted Frames 2 Lace Squares. 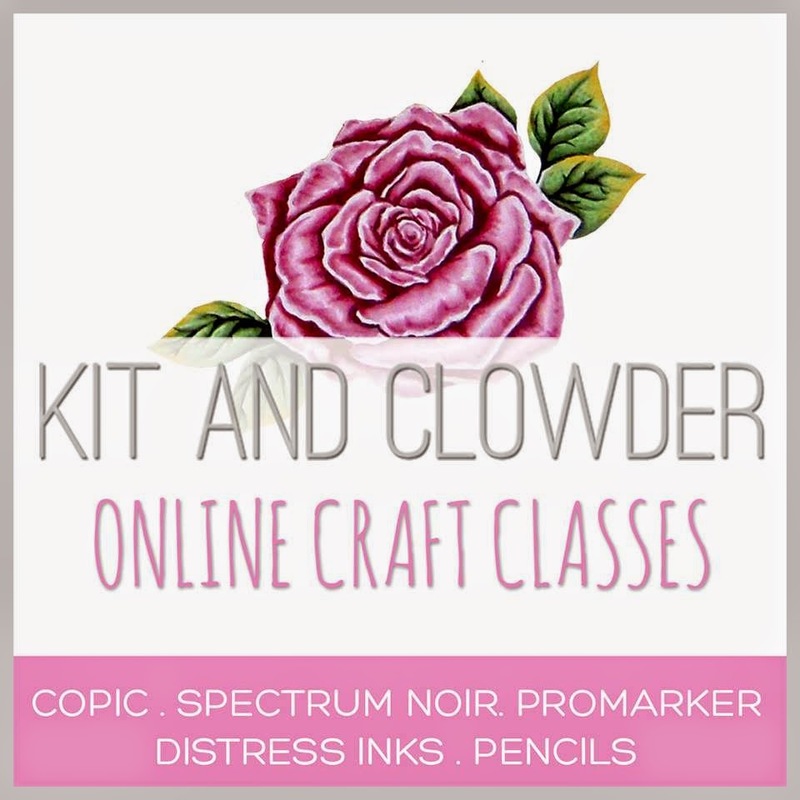 So rather than sitting them a side yet again I decided to use them along with this "coloring" post for Elizabeth Craft Designs. 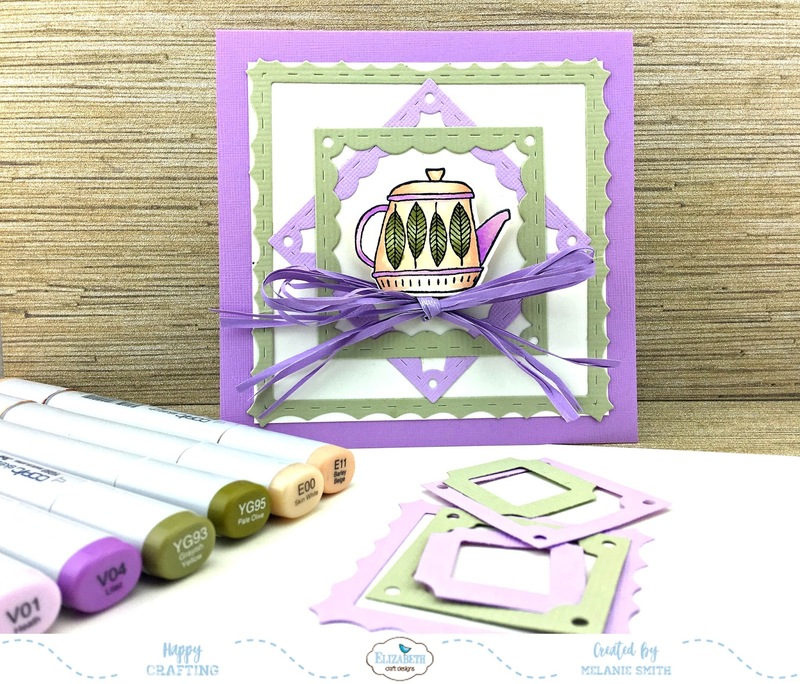 My card is quite simple using 3 of the pieces left from the die set along with a tea pot from the "Tea Time Clear Stamps" I have colored the tea pot with my Copic markers purposely to coordinate with the scraps left over from the dies. As you can see below I still have pieces left. Pretty cool that we can get about 3 projects done with one die set.